1. Go to the Contact Us page and fill it out. We will get back to you in a day or two to confirm involovement. 2. We mail you FREE Order Forms. 3. Take orders and money from people. 4. Send us the order forms and half the money. To start a new fundraising campaign first goto the Contact Us page and fill out the form. You must contact us before you start taking orders so we can prepare for when you will be done fundraising (or we can not guarantee a next day delivery). All accounts also receive free full color order forms for all their participants after confirmation of involvement. Groups Can Create A Custom Heart Design. In addition to the standard 10 colors we make (pink, red, orange, yellow, green, aqua, blue, lavender, black, and white) you can choose any 2 of our 10 standard colors for us to combine. We then design a custom heart to match your school or groups' trademark colors for you to sell. 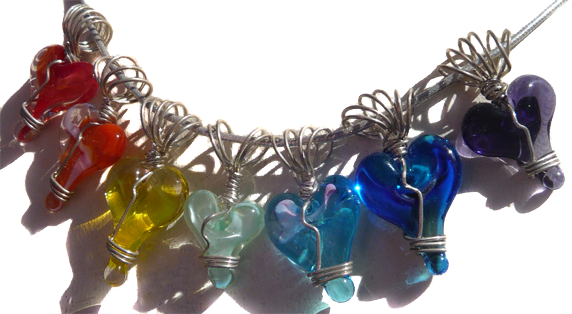 All Custom Colored Hearts are made to order for each fundraiser.